NASHVILLE—Eclipse fever struck Nashville like an unexpected sunset, clogging parking lots and bars with eager visitors. It inspired country musicians to invent new words, and sent vendors to the streets to hawk merchandise as if it were the Solar Super Bowl. Everyone’s eclipse experience is unique. The largest city along the path of totality, Nashville, Tennessee, had the opportunity to give the eclipse a distinctly American flair. “Some redneck is going to forget these tomorrow,” country musician Wynonna Judd said after fishing a pair of eclipse glasses out of her bra on stage at the Grand Ole Opry the night before. Eclipse fever started at the airport in New York the day before. Southwest Airlines gate agents reminded passengers that we could keep our boarding passes as souvenirs for the “solar lunar thing.” As the flight boarded, the attendants asked, “How many passengers are going to Nashville just to see the eclipse?” Most folks on the flight raised their hand. Bonnie Tyler’s Total Eclipse of the Heart cracked over the plane’s speakers at an uncomfortable volume. I rented an enormous pickup truck as soon as I arrived, because as long as I’m an American in Tennessee I’m going to act the part. I headed to the most American restaurant I could think of: Cookout, the infamous home of a five dollar tray deal where corn dogs and quesadillas serve as side dish choices to accompany hamburgers. Outsiders made their presence known—a pair of out-of-towners behind me whispered about the ridiculous excess. Foot and automobile traffic swamped the city’s downtown the night before. Hawkers peddled Music City Total Eclipse t-shirts on every corner while a cacophony of country music blasted from Broadway’s endless row of honky-tonks. In one of the pedal-cart bars rolling by, a corps of elderly women shrieked “Sweet Caroline” while one husband filmed with a go-pro. Acme Feed and Seed, a three-story restaurant and music venue, had virtually no remaining seats as eclipse chasers filled up on a Last Supper of ribs and hot chicken. The lead blues singer on Acme’s stage asked how us Eclipsapalians were doing in a New Orleans accent. “Eclipsatarians,” he corrected himself. Jim Wehrfritz drove from Western New York with his wife and son to visit their daughter in Nashville. They found it nearly impossible to find a hotel room when they began looking three weeks out (he said they ended up getting lucky). But he was just excited he’d get to see the celestial sight in Music City. “There’s going to be nightlife on Broadway in the middle of the day,” he said. Eclipse fever even struck the city’s Grand Ole Opry, the 4,400-seat country music mecca and broadcasting studio. The venue hosted back-to-back total eclipse concerts the evening before, a performance that alternated jangle with jargon. The crowd sang along to Darius Rucker’s Wagon Wheel before The Weather Channel’s Jen Carfagno took the stage to deliver a weather report. “It will be partly cloudy in the low 90s,” she said. “There’s a storm system coming,” she paused and the crowd booed. “But not until late Wednesday,” and the stadium shook with applause. No weather report is certain, of course. Both the night before and the day of, more science-minded visitors headed to the Adventure Science Center. I, a fellow nerd, joined them for a festival and days of lectures from preeminent scientists on topics ranging from the Sun to Jupiter’s Juno Orbiter and even gravitational waves. But even for many NASA scientists present, this would be their first eclipse. On eclipse day, folks prepared to watch the eclipse with their glasses, cameras and telescopes. Jeff Forslund, an amateur astronomer from Franklin, Tennessee, set up his camera beside the science center to capture footage for the Google and University of California, Berkeley Eclipse Megamovie citizen science project. The project hopes to combine images and videos from thousands of photographers to create a continuous movie of the eclipse as it crosses the country. Forslund was especially excited to be able to take part in a large endeavor. “You’re feeling like a part of something bigger,” he said. A crowd of around a hundred watched the Moon begin to slowly obscure the Sun atop Fort Negley on a hill behind the science center, beginning around noon, central time. They seemed to welcome the occasional shady clouds in the humid, 95 degree heat as partiality descended upon them. The leaves served as pinhole cameras projecting tiny eclipses on the ground. But, expecting a 1:27PM, CT totality, folks soon began worrying the weather might spoil the show as puffy clouds dotted half of the sky. Around 1:15, the eclipse seemed like it would stay unobscured in a clear patch of sky. The city dimmed and the temperature began to drop. At 1:20, a single, large grey cloud snuck up like a runaway parade balloon, and at 1:24, it parked in front of the Sun. Folks groaned, some chatted about somehow running somewhere else. At 1:27, the sky began to turn dark, the Sun now blocked by both the Moon and the cloud. 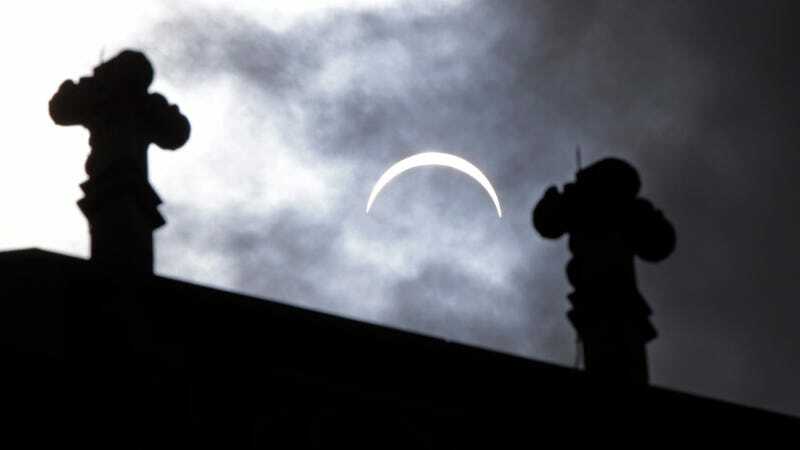 Without a visible solar corona, the eclipse watchers noticed other peculiarities. Crickets and birds began chirping, cicadas started rattling, and the brightest stars appeared. The entire city of Nashville was in sunset, no matter the direction we looked. Folks gasped, and headed to the opposite side of the hill to take in the view of the darkened skyline. We heard cheering from downtown, where the cloud didn’t obscure the view. Still, one rallying cry managed to offer some comfort: The next American total solar eclipse is in 2024.